At the Baikonur Cosmodrome in Kazakhstan, a Russian Soyuz rocket lifted off at 6 a.m. EST (5 p.m. Kazakh time) with the Progress M-26M spacecraft containing almost three tons of cargo bound for the International Space Station. This morning’s flight marked the first of the year for the Russian Federal Space Agency (Roscosmos) which utilizes the venerable Soyuz booster / Progress spacecraft duo to carry out resupply runs to the orbiting laboratory. The flight got its start from Launch Complex No. 1. Progress is an uncrewed version of the Soyuz spacecraft that can trace its lineage back to the early days of human space flight. Progress is a robust design that can not only carry fuel, food and supplies to the residents on the ISS, it can also be used to boost the station’s altitude as well as control its orientation when necessary. 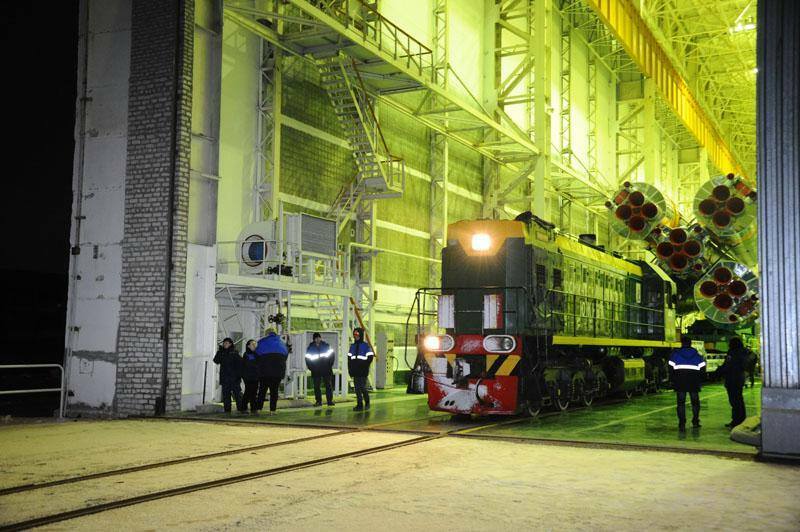 Progress M-26M and the three stage Soyuz were rolled out to the launch pad in Kazakhstan on Monday, Feb. 16 via railcar. Weather conditions at the launch were frigid with temperatures a chilling 18 degrees as fog settled along the surrounding steppes. Similar to Soyuz, Progress is comprised of three modules: cargo (on Soyuz it is called a crew) module, a refueling module, and the instrumentation module. The cargo module is capable of carrying 3,748 lbs (1,700 kilograms) worth of supplies to the ISS. It has a pressurized volume of approximately 212 cubic feet (6 cubic meters). The crew accesses the supplies within via a docking hatch. 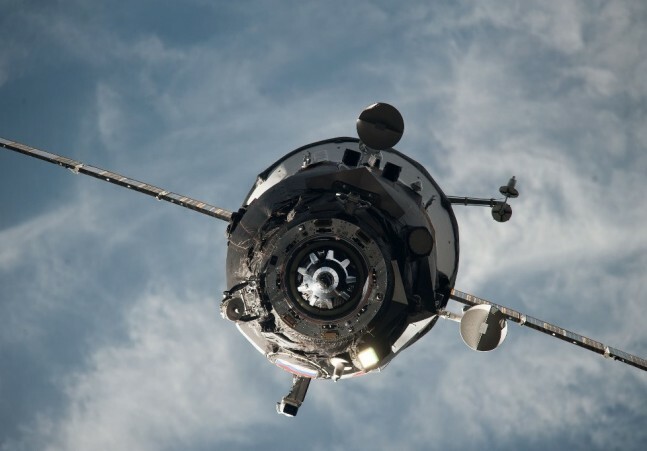 In preparation for its departure from the station, the crew will remove the cargo and supplies, and refill the roughly 24 foot (7.23 m) long spacecraft with spent experiments and trash. Generally, a Progress spacecraft departs the station in the lead up to the launch of the next Progress. 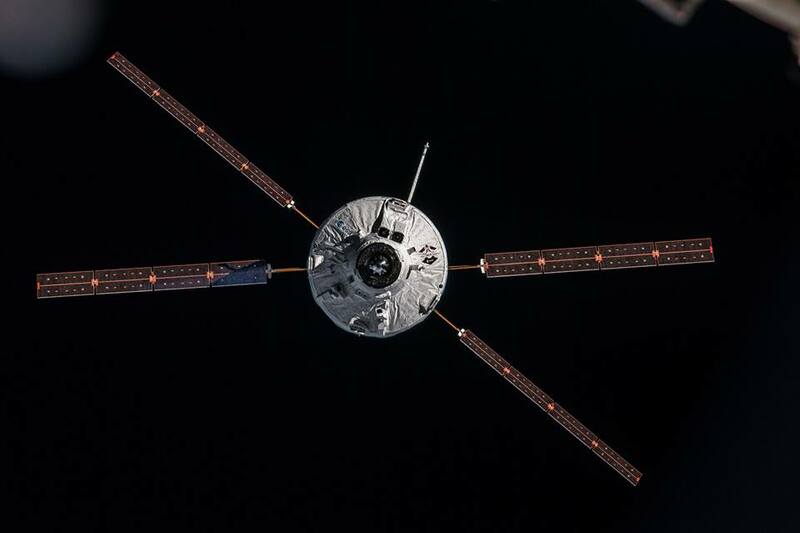 In this case, rather than another Progress spacecraft, it was the European Space Agency’s Georges Lemaître Automated Transfer Vehicle which cleared a port for the M-26M. The current booster used to launch these cargo vessels is the Soyuz-U — an upgraded version of the Soyuz LV and part of the R-7 rocket family — which can trace its lineage back to the launch of Sputnik-1 in 1957. The Soyuz family of rockets has a 97 percent success rate, having carried out more than 770 flights since the first flight of the booster on Nov. 28, 1966. Twenty seconds prior to liftoff, the Soyuz-U’s core booster, along with the four liquid-fueled boosters (each of which is powered by a single RD-117 rocket engine, directing its thrust through four vernier combustion chambers ) were activated. Eight seconds later, the gantry, which covered the rocket was retracted and both the Progress M-26M spacecraft and its Soyuz-U launch vehicle were operating on internal power. Ten seconds prior to liftoff and the engines were ignited, ramping up to full power liftoff took place promptly at 6 a.m. EST, throwing light as bright as a blowtorch across the misty, frozen terrain. It took the rocket a full nine seconds before it had cleared the pad. The launch vehicle conducted a pitch and roll maneuver at about 15 seconds into the flight – placing it on the correct trajectory to rendezvous with the station about six hours after launch. Within just one minute of launch Soyuz and Progress had cleared the point of the flight where the vehicle’s speed conspired with the pressure outside to place it under the greatest amount of stress during the mission. Known as maximum dynamic pressure or, more commonly, as “max Q.” After clearing max the booster and its precious cargo went supersonic. With just 70 seconds elapsed on the mission clock, the vehicle stack was exceeding 1,100 miles (1,770 kilometers) per hour. Two minutes and five seconds into the flight, having completed their mission, the four liquid-fueled boosters were jettisoned. They fell back to Earth, impacting the Earth far below (the region is an unpopulated section cleared of personnel). A little less than three minutes into the flight, another component of the stack, the payload fairing, having shielded Progress M-26M through Earth’s turbulent atmosphere, is also jettisoned, left to tumble away into the black of space before burning up in Earth’s atmosphere. Three minutes elapsed time and Progress was traveling at 5,000 miles (8,047 kilometers) per hour – and accelerating. At about four minutes in the engine burn was completed marking the way to the next stage of the mission. At just 10 seconds shy of five minutes flight time, the second stage was jettisoned. About three minutes later and Progress 58 was traveling at about 14,000 miles (22,531 kilometers) per hour. It took less than nine minutes for the Soyuz-U booster to loft the Progress M-26M vessel to orbit. Soyuz-U’s core stage serves as both first and second stage for the rocket and measures some 91 feet (28 meters) in length and 9.67 feet (3 meters) in diameter. Each of the rockets is fueled by an estimated 204,920 lbs (92,950 kilograms) of fuel. The Soyuz-U burns a refined version of kerosene known as RP-1 (Rocket Propellant 1) and uses liquid oxygen as an oxidizer. 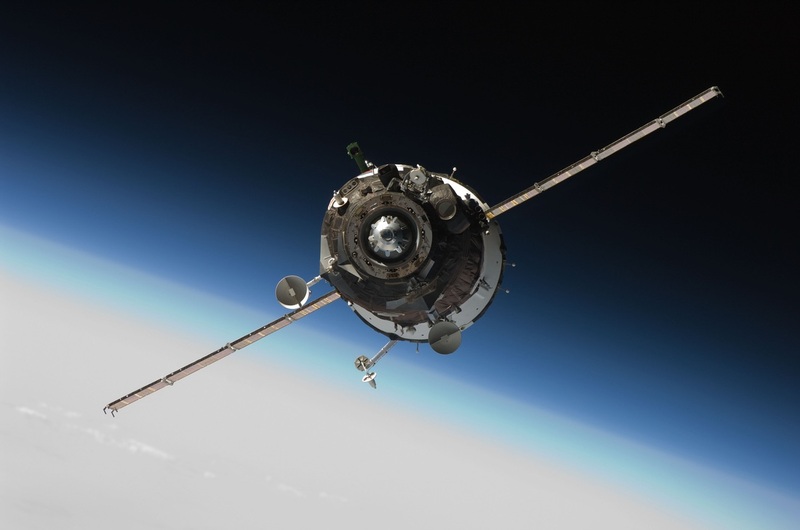 Progress M-26M is slated to rendezvous and dock with the outpost at 11:58 a.m. EST (16:58 GMT). It will then dock to the station’s Zvezda module. The first Progress spacecraft was launched on Jan. 20, 1978, with the craft’s first deployment to the ISS taking place in 2000. Today’s flight marks the 58th flight of the spacecraft to the ISS so far. 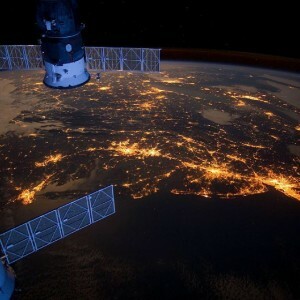 Normally, a Progress spends an estimated six months attached to the ISS. Unlike its close cousin, Soyuz, Progress lacks the ability to have its cargo module return to Earth and is destroyed upon reentering the atmosphere. Rather than incorporating the Soyuz Descent Module, Progress 58 employs a refueling module, which has some eight propellant tanks, containing as much as 3,836 pounds (1,740 kilograms) of fuel. Four of the tanks contain fuel and the remaining tanks contain the fuel’s oxidizer. The amount of fuel that Progress carries, is determined by the amount of cargo that the spacecraft has been tasked with carrying aloft. The contents of these tanks can be transferred to the ISS’ own propulsion system as needed via connectors that have been placed with the docking ring. As noted, this fuel can, in turn, be used to either increase the station’s altitude or to alter its orientation.